Clearly I jest, so let me spell out exactly why this type of thing drives me nuts. The source of the original post was actually a perfectly reasonable, helpful and interesting book called “Time to Eat the Dog? The Real Guide to Sustainable Living” by Robert and Brenda Vale. In it, the authors examine all manner of activities that define our domestic lives and lay out the environmental impacts associated with each. In short, they quantify just how green our various behaviors are. So, while there may be the inevitable quibbling over their methodology, what’s not to like? Nothing, as far as I’m concerned. My problem begins with what happens after these types of resources come out. A little context: My job is taking the often complex issues of placemaking, growth and development and making them simpler. Distilling them. Not because people are too simple-minded to understand them but because they often lack connection to the subject matter or bandwidth to otherwise process it. That’s why complexity doesn’t go viral — simplicity does — and efforts to build support around big ideas involves first reducing them to more digestible little ones. I get it. I do it. But I take issue with the form this process tends to take: the counter-intuitive soundbite. Consider dogs vs. SUVs. What could be wrong with such provocative framing? After all, if it piques interest, people will be more inclined to share. It’ll blast its way around the social web, gaining ever greater exposure. More eyeballs, more awareness, more potential converts, right? Maybe. But at what cost? I’ve written before about interdependency and its impact on community resilience. In the context of sustainability’s three-legged stool, social strength is the leg that tends to get short shrift, as advocates invest the bulk of their resources into more immediate efforts to salvage the environment and shore up our fledgling economy. But that’s a mistake. In fact, I assert that true sustainability — the ability to keep on keepin’ on into an uncertain future — will never materialize in the absence of community. And that’s why these soundbites drive me nuts. Because they reinforce our basest human instinct — our need to cast judgment on the behavior of others — which is in every way contrary to the formation of the complex, local social networks that make sustainability possible. At a time when we need to be reconnecting, opening our hearts and minds to conflicting opinions, exploring shared interests, and charting common ground like never before, the comparative soundbite encourages us to think along the lines of who’s doing good and who’s not doing good. Who’s better and who’s worse. Great. Let’s save the world by divvying up into camps, each casting a suspicious eye towards the other. SUV drivers? Hey, don’t feel bad. That old lady with the beagle is way worse than you. She’s the problem. It happens over and over again. All too often, efforts towards sustainability involve leveraging the latest data towards some kind of public shaming exercise. Which only serves to divide us even further. I’m not blind to the fact that addressing my complaint would basically involve a complete retooling of how people behave on the internet. Which is to say that it will never happen. There will always be reductionist assertions that all our do-gooding is actually a whole lot of bad-doing and that those sanctimonious people pointing the finger should really be the recipients of such judgment. In the end, what should really be our ongoing pursuit of context-setting, big-picture facts becomes just another reinforcement of the very behaviors that will prove to be our undoing. We need to build stronger communities at the local level. Not because of their carbon metrics but because that’s the level at which problems will be increasingly addressed and solved in an ever-changing world. Communities that can work together, who need each other, who can build robust economies around mutual goals, and who can analyze behaviors in the aggregate and agree to meaningful collective changes, will be the winners. Wanna maintain your club of who’s eco-friendly and who’s the opposite? Fear not. At least for the foreseeable future, the internet will continue to serve up a never-ending buffet of tasty factoids that paint your neighbors in a most unflattering light. That way, your efforts can be fueled not just by passion but by righteousness. But if you really want to make a contribution towards the resilience of your community, and with it the earth, walk across the street to the house with no hybrid in the driveway, or no solar panels on the roof, or no clothes line in the backyard. Come to understand their fears and concerns for their children’s future and then consider them in the context of your own. What will it take to find common ground? I can’t tell you for sure, but I can tell you this: It won’t start with you telling them their dog is killing the planet. This is the most intelligent thing I’ve read in a long time. Makes me want to envision a Star Trek-esk future of small groups of interdependent communities working together in harmony… I can, at least, dream, can’t I? I’m actually surprised how non-viral the attack on dogs has been- I don’t think I’ve ever seen anyone post this on Facebook. How come? Simple answer: the more common something is for the educated/socially liberal wing of the American middle class, the less likely it is to be stigmatized by environmentalists. 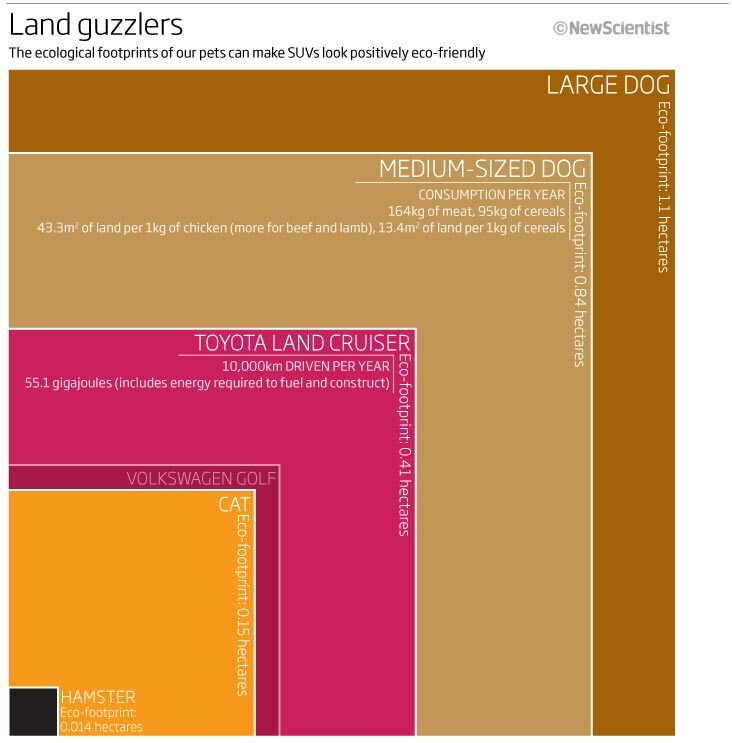 Middle-class Americans like dogs, so they get less sustainability scrutiny. By contrast, anything perceived as “cheap” and/or “plastic” gets lots of environmentalist attacks. Similarly, Wal-Mart (which is more likely to be in poorer areas and serve poorer consumers) gets more attacks than more upscale big boxes. Well dang, LJ. Then I guess the only thing that makes me grumpier than selective factoid divisiveness is selective bogus-factoid divisiveness. I have to agree with your basic thesis that community is the basis of sustainability. I wrote about how community helped NYC after 9-11, not long, private driveways and security gates.